CHICAGO (WLS) -- An anti-violence demonstration scheduled for Monday plans to shut down a part of the Kennedy Expressway aiming to disrupt traffic to O'Hare International Airport. The Labor Day protest is led by Reverend Gregory Livingston, who organized a similar protest that shut down a part of North Lake Shore Drive on August 2. At 11:30 a.m. Monday, protesters plan to meet at the Cumberland Avenue entrance ramp for a rally. They then plan to march along the Kennedy to the River Road entrance ramp. Illinois State Police tell us they have a plan in place and are coordinating with Chicago and Park Ridge police. ISP said their goal is to make no arrests. As in the Lake Shore Drive march, protestors are asking for the resignation of Mayor Rahm Emanuel, more economic investment in the South and West Sides, and awareness of Chicago's gun violence issue. 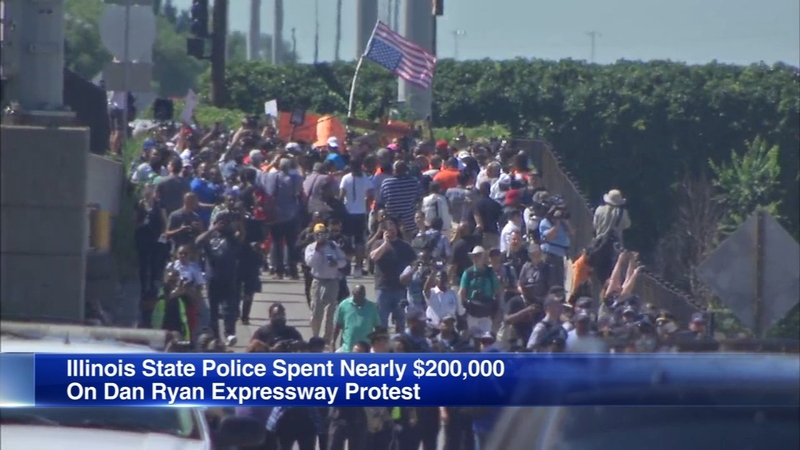 The state's response to the protest that shut down the Dan Ryan Expressway earlier this month cost taxpayers more than $200,000, the Illinois State Police revealed this week. Demonstrators plan to disrupt holiday traffic to and from O'Hare Monday.